Tag line: "For the thousands who remember its unparalleled drama, action and romance!" 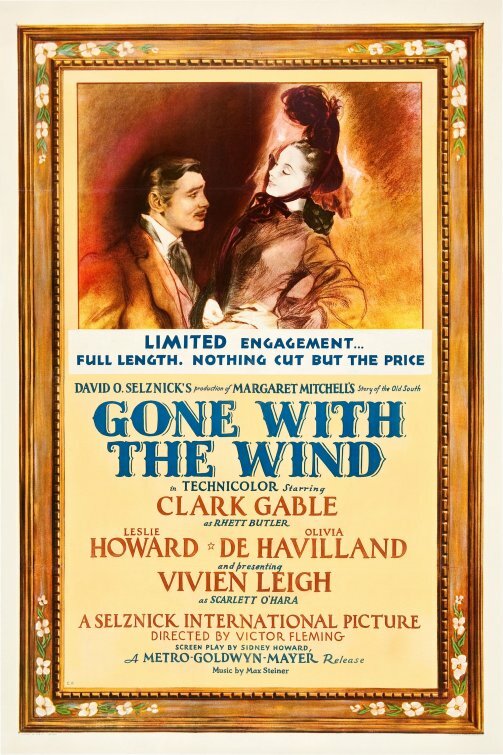 Gone with the Wind continues to rank as one of the most beloved motion pictures of all time, and while the film’s rather pedestrian approach to slavery may cause modern viewers to raise an eyebrow or two, the movie has lost none of its power to entertain. 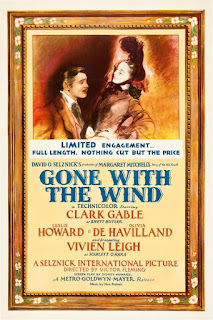 Based on the best-selling novel by Margaret Mitchell, Gone with the Wind is set against the backdrop of the U.S. Civil War, and details the trials and tribulations of Scarlett O’Hara (Vivian Leigh), a southern belle willing to do whatever it takes to survive in a land torn apart by conflict. Left heartbroken years earlier when the man of her dreams, Ashley Wilkes (Leslie Howard), married the saintly Melanie Hamilton (Olivia de Havilland), Scarlett now uses her feminine wiles to entice men, marrying (and being widowed) several times, and becoming a wealthy woman in the process. Through it all, one man was determined to win her heart: the handsome Rhett Butler (Clark Gable), whose attentions she continually brushed aside. Eventually, Scarlett does agree to marry Rhett, yet her love for Ashley is as strong as ever, causing a rift between husband and wife and forcing Rhett to make some difficult decisions. As the ill-fated lovers, Gable and Leigh are beyond superb, and the supporting cast is equally impressive, especially Olivia de Havilland as Melanie, whose virtue is a constant thorn in the side of the scheming Scarlett. The film also has its share of unforgettable images, like when Scarlett, walking the streets of Atlanta, becomes lost in the crowd as the camera slowly pulls back, revealing hundreds of wounded soldiers lying all around her. From the way it handles the on-again / off-again romance of its two leads (a love affair as tragic as any Shakespeare ever conjured up) to its remarkable costumes and larger-than-life set pieces, Gone with the Wind is a textbook example of epic filmmaking at its finest. Naturally, as one would expect from a motion picture glorifying the south in the days preceding, and immediately after, the Civil War, Gone with the Wind isn’t the most socially conscious work to emerge from Hollywood’s Golden Era. Were it remade today, I imagine the issue of slavery would, at the very least, be addressed, and not glossed over like it is in this film (I assume Ms. Mitchell’s novel comes up short in this area as well). Clearly, the American South was a wonderful place for some, but it was also a hellish nightmare for thousands of others, and it’s strange, in this day and age, to watch a movie that seems oblivious to this fact. Though lacking in social commentary, there’s no denying Gone with the Wind is still every bit as grand, every bit as heartbreaking, and every bit as awe-inspiring as it was in 1939. It is the granddaddy of screen romances, and more than likely will remain so for generations to come. Okay, so I haven't actually watched this in over ten years, but I have to be honest. My memory tells me it's one of the most overrated and boring movies I've ever seen. Someday, I'd be willing to give it a rewatch, but I'll need to set aside like 8 hours for it, so I'm not sure when that will be. I'm all for it being better this time around, but I'm not holding my breath. I watched this flick a few years back when I was trying to fill out my movie-watching with classics that I'd never gotten around to watching before. The first half of the movie, in my opinion, was excruciatingly slow and boring. That said, I thought that post-intermission, the second half of the flick really made up for the first half. Scarlett stopped being so useless and the movie got really dark in some parts. Also, I agree about the pull-out shot on Atlanta, showing the ravages of the war. Whether you love or hate the movie as a whole, that is a brilliant shot.